On the fourth floor of the Peter Munk Cardiac Centre, Gail Power takes great pleasure in watching the smile return to the face of Robert, her husband of 44 years. Especially since it was only a few short months ago that Robert’s chances for survival looked bleak. In 2006, to help control his arrhythmia, doctors treated Robert with an implantable cardioverter defibrillator (ICD). It helped control abnormal heart rhythms and contain any dangerous arrhythmias, but as his condition worsened, the ICD began to fail. Eight years later, Robert’s heart function had regressed to stage D heart failure, where conventional therapies and symptom management strategies no longer worked. 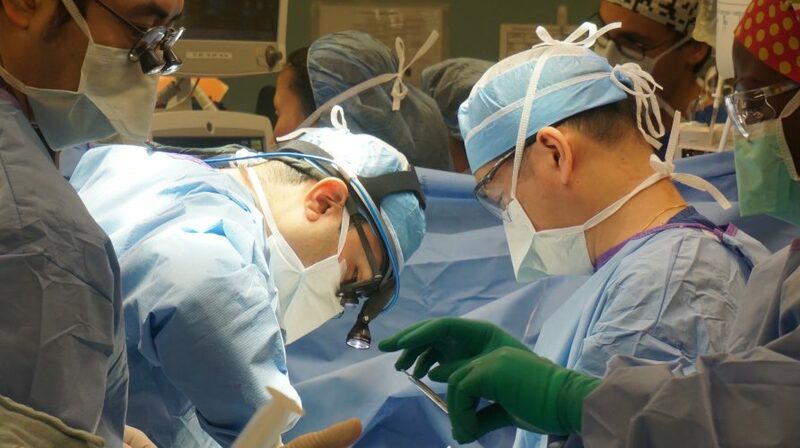 On Halloween Day, 2014, a surgical team led by Dr. Vivek Rao, chief cardiovascular surgeon at the PMCC, successfully implanted a novel mechanical device into Robert’s heart. The surgery was part of a first-in-Canada clinical trial for the HeartMateTM. It was the most advanced technology available in mechanical circulatory support. The HeartMateTM III is designed to replicate the pumping action of a heart that is too fragile to pump on its own by replacing the failing muscle’s left ventricle. For a high-risk patient like Robert, it meant less invasive surgical implantation, reduced blood trauma and better portability with an active lifestyle. Dr. Rao says it should prove to be a more durable device that has a greater handling of the blood flow, and anticipates fewer adverse complications than older models.